Exploring Vietnam is a unique experience, sure to fulfill the wanderlust of any traveler and especially on your Honeymoon! On your 14 day custom romantic adventure you will have the opportunity to visit and admire Hanoi, Ha Long Bay, Hue, Hoi An, Ho Chi Minh City and Phu Quoc Island. Wander through centuries of rich history, marvel at the pristine beauty of the landscapes and immerse yourself in the traditional culture. This trip will guide you on an off the beaten path exploration through the eyes of locals and offers a sample of some of the best Vietnamese cuisines. 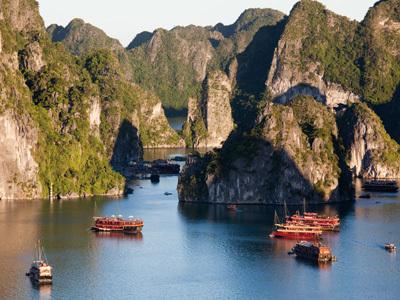 From cruising on Ha Long Bay to riding on the back of vespas, you will experience it all! Today, after breakfast, you will leave for Ha Long Bay, one of the most spectacular UNESCO World Heritage Areas and the world’s largest marine limestone ‘karst’ landscape. There you’ll board your boat, a new 5 star luxury cruise vessel, that will take you first to the busy World Heritage area and then to one of the most well-known grottoes and caves, and then kayak (optional) around the area. Weather permitting, you will be able to swim from the boat and enjoy the clear emerald water. All your meals will be provided on board, usually based on fresh seafood, and you’ll sleep in a cabin with an en suite toilet and shower. You’ll wake in fresh air of the bay with a swim and/or a Tai Chi session on the large sundeck (beginners welcome!). After a light breakfast pastry and tea or coffee, you’ll enjoy the peaceful surroundings of Thien Canh Son Cave and islets, a wild and mysterious beauty in the middle of this UNESCO World Heritage site. Enjoy a delicious brunch while cruising back to dock around noon whereupon you’ll leave for Hanoi, and connect with your flight to Hue. Upon arrival in Hue, you will be met and transferred to your comfortable accommodations. 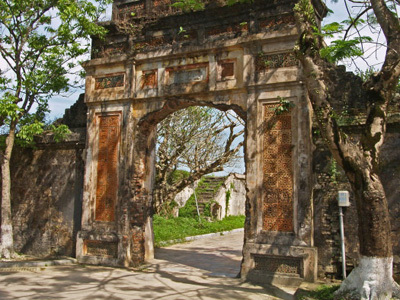 After breakfast, your guide will arrive to take you on a tour of Hue’s ancient citadel, once the seat of the Emperors of the powerful Nguyen Dynasty that ruled Vietnam from approximately 1800 to 1945. You’ll begin with a stroll around the area between the Citadel’s massive walls and the defensive moat, now filled with lotus flowers. You’ll then enter via the Noon Gate to wander around the Thai Hoa Palace, the Pavilion housing the Nine Urns of the Nguyen rulers, and the remains of the Royal Palaces, followed by a visit to the Museum of Antiquities. 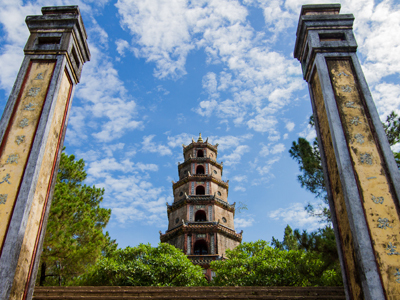 In the afternoon, you will take a cruise along the Perfume River to visit to the Thien Mu Pagoda. From there, you’ll drive to the Royal Tombs of Emperor Minh Mang. 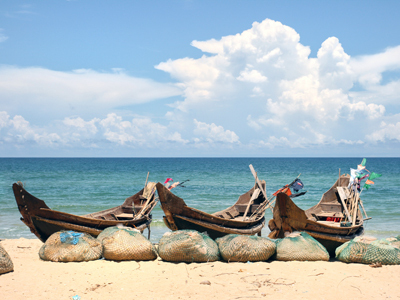 After checkout this morning, head to Hoi An via Lang Co. Embark on the local boat to enjoy the idyllic panorama of crystal clear water home to crabs, snappers, red mullets, groupers, shrimp and squid. Observe a demonstration of the local fishing technique and visit an oyster farm. Enjoy a delicious seafood lunch in an authentic stilt house above the water and take the option to swim or snorkel afterwards. Continue to Hoi An - on the way, you'll cross the Hai Van mountain pass. The views from the top are excellent – you should be able to see Lang Co beach and village, and the lagoon far below, with Danang spread out before you to the south. 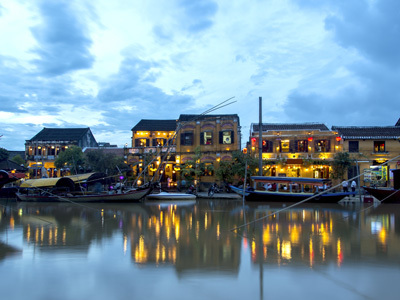 Upon arrival in Hoi An, you'll be transferred to your hotel to spend the rest of the evening free at your leisure. Today's cultural adventure offers an exclusive look into both the local farming and fishing communities. Accompanied by your expert guide, your day begins with a leisurely cycle across country roads. This will be your chance to witness local Vietnamese rural life first hand. Hop off your bike to explore an organic vegetable village, where you will help to water and plant vegetables, and hoe the soil with the instruction of a local farmer. Watch the ducks, as they swim along the rice farm, or observe the farmers tending to their crops, as they go about their daily routines. You will have plenty of opportunities to engage with the friendly local people, who will be greeting you throughout the day. In the evening, you’ll be picked up at your hotel for a Vespa evening tour. Your first stop is to Café zoom to "watch the world go by" and enjoy a cocktail and appetizer (inclusive) before adventuring into a favorite local eating spot. 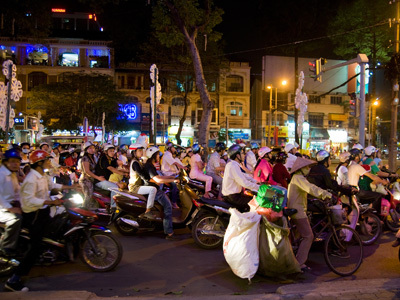 You’ll experience the nightlife of Saigon the way locals do, all from the back of a vintage Vespa scooter. Then the tour will continue on to a hidden Vietnamese-style coffee shop where you'll be able to enjoy live Vietnamese music. The tour will start with a ride to part Chinatown and then heading to District 4 through busy streets and alleys to see the night life of locals and enjoy street sea- food and cold drinks, places that foreigner won't be found. Leaving district 4 to district 3 the tour pass through downtown district 1 to take in the sights on the way to Banh Xeo, specialty of Saigon, and southern food with the locals. 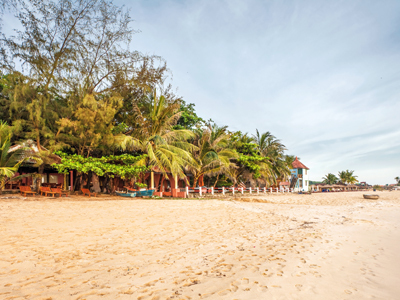 Phu Quoc is Vietnam’s largest island. 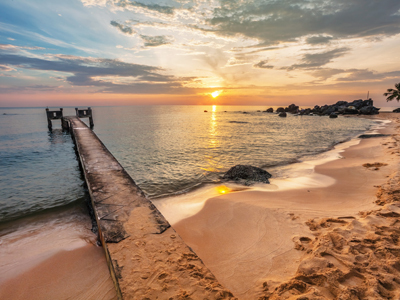 Located in the Gulf of Thailand, has a wide variety of beaches, some regarded as the best in Vietnam. 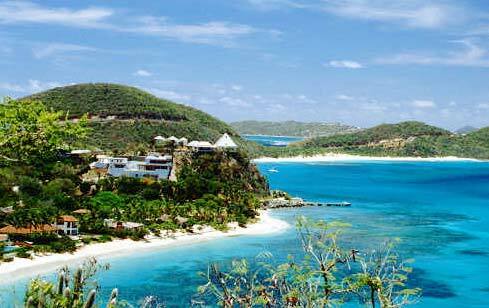 Tropical jungle runs directly into beaches running for miles up and down the coast of this island. It’s recently been ‘discovered’ however there remains plenty of opportunities to explore untouched landscapes and get off the grid. Sadly this is your departure day. At the appropriate time, you will be picked up and transferred to the airport in time for your outbound flight home. We hope you enjoyed your experience and we wish you a pleasant flight home! Nestled in the heart of Hanoi, Silk Path Hotel Hanoi offers an unrivaled value to explore the local attractions and culture that the city has to offer. The distinctly eclectic decor blends beautifully with the modern facilities, creating a truly indulgent experience. Silk Path Hotel Hanoi is renowned for its hospitality. From the moment you arrive, the team carefully anticipates each of your needs and notes your individual requirements and preferences. With their passion for service, timeless decor and impeccable attention to detail, the property includes everything you could wish for during your stay in Hanoi. 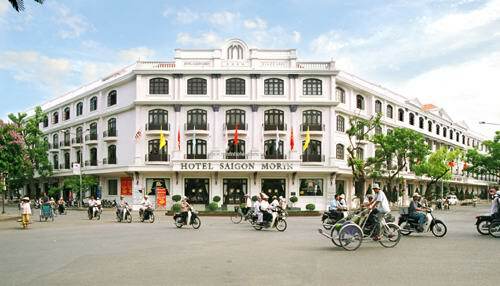 Built in 1901 by a French businessman, the Morin Hotel is the oldest hotel in Hue City, Vietnam. A rare survivor of many wars, this is more than a hotel, it's a part of the history of Hue city over the last 100 years. Now lovingly restored to its century-old glory, Hotel Saigon Morin is once again ready to live up to it's reputation as the choice of celebrities, intrepid adventures and businessmen. The Hotel offers everything a discerning traveller would expect form a world-class hotel without sacrificing the old world charm that made the Morin Hotel legendary. Come explore the rich heritage of Vietnamese cuisine and culture at this 4 star boutique hotel. Hoi An Resort is located ideally on Hoi An beach, just 5 minutes from Hoi An center and thirty five minutes from the airport. 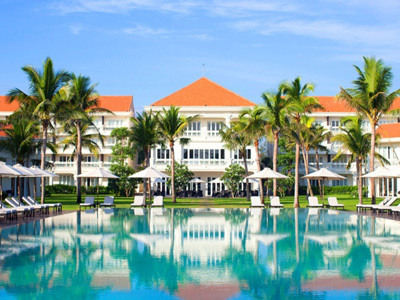 At Hoi An Resort guests have a choice of the modern living where they can unwind by the pool surrounded by tropical gardens or villas directly on the beach facing the sea with large terraces for a private time. Each room at this hotel offers views of the sea with private balconies and some of the rooms have direct access to the beach from a private terrace. As a 4-star standard hotel, Eden Saigon is located right in the center of business, shopping, commercial and entertainment of Ho Chi Minh City and only a 5 minute walk from the Ben Thanh Market. From the very beginning, the Hotel targets the customers for business and leisure purposes. With the advantage of convenient transportation system, Eden Saigon Hotel also offers the luxury guest rooms, hospitable services as well as the completely furnished business facilities. 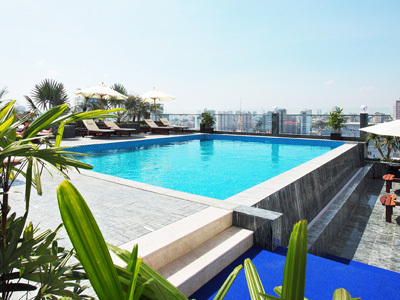 The hotel also has massage area and fitness center with an outdoor swimming pool and bar with views of the city. Mango Bay is an unusually low density resort, of 40 bungalows, spread along one kilometer of beach, amid twenty hectares of largely endemic forest and gardens. The resort lies on Phu Quoc, an island in the Gulf of Thailand, the size of Singapore, adjacent to Cambodia, and belonging to Vietnam. Development has been led by a passion for the environment, intelligent use of materials, and strong support for the island culture.